Powers/Abilities: Great strength; ability to release powerful waves of magnetic force; body made from extremely hard LX alloy and titanium carbide; eyes equipped with automatic-focusing infra-red lenses; computer brain releasing latent potential for ESP, telekinesis and tele-transportation; rocket boosters in his feet enabling him to run fast and leap great heights and distances; originally powered by a battery pack that required periodic electrical recharging, later modified by Marianne into a solar battery that derived unlimited energy from the sun. 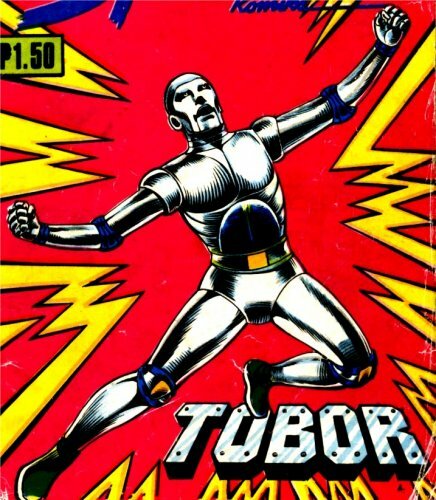 History: Tobor was a breakthrough in artificial intelligence, a super robot with the potential for human emotion. Surviving the bomb blast that killed his inventor Oliver, he traveled to the Philippines where he quickly established himself as a hero. He later met Oliver's fiancée Marianne, who became his companion on many of his adventures. Also a scientist, Marianne made a few modifications on Tobor's design. Among the villains that Tobor faced were the fourth dimensional sorcerer Txandu, the space bandit Vart Daver, and his team of animal-based super criminals The Organization. Comments: Created by writer Berth Brucal and artist Al Cabral. Thanks to Dan Ramon P. Geromo for information and images. Thanks to Aris Panganiban for filling in almost all the blanks, and effectively writing most of this profile.